Adjustable Length: 31.4 "- 56.36" Comfort Width: 1.5 "Thickness: 0.2cm. Made of 100% cotton and leather ends(Firmly tied your Guitar). Compatible with all size ukulele, Banjo, Guitarlele and Acoustic Guatir, Electric guitar. Adjustable size perfectly suited to adults and children over 5 years. Exquisite weaving process & do not fade color and Colorful national wind patterns. The belt is 100% cotton! ! Lightweight, breathable, excellent in flexibility, outstanding to wear. Unlike nylon and polypropylene straps, the stability on playing is excellent with a moderate slipperiness. Use leather for pinholes! ! It is multi-structure of 5 mm thick and excellent in durability, it can withstand fallout etc due to frequent attachment and detachment. 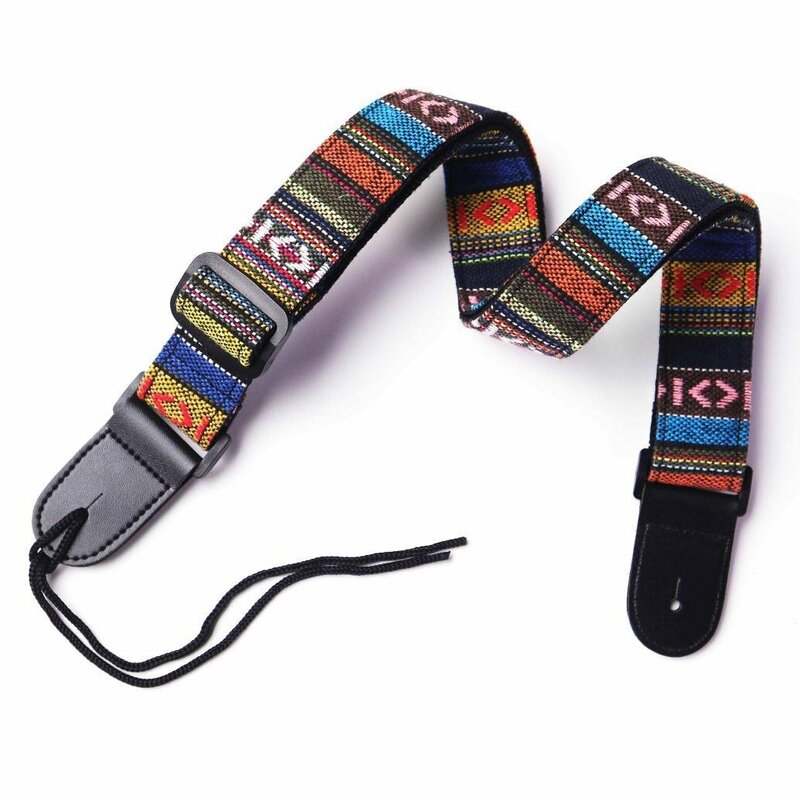 It is a general-purpose strap that you can use for various instruments such as electric guitar, acoustic guitar and ukulele. Cowhide (velor) is used for pinhole! ! It is a 4 mm thick multi-layer structure with excellent durability and withstands fallout due to frequent attachment and detachment. The rear part is equipped with a leather cord and it can be used as an attachment for a guitar without a strap pin. Since the adjustment range of the strap is wide, regardless of physical disparity, such as height and weight, regardless of gender, it is possible to appropriately adjust long and short as a free strap. Because it is equipped with Delrin material sliding type adjuster, it is possible to adjust the length instantaneously. This makes it easy to use the strap's long and short depending on the tune during live concerts. Black leather (genuine leather) is adopted as the hole part where the strap / pin hangs, and high durability is realized. Inexpensive straps often use thin synthetic leather for the hole part, there is a danger that the skin will wear out and cause a guitar fall accident. This strap is made of hard and thick black leather and it keeps stable strength, so you can use it with confidence. It is also attractive to be able to enjoy the texture of leather that will become familiar as you use it.